Where to turn for pain relief - acetaminophen or NSAIDs? The first line of treatment for many knee and hip problems includes taking over-the-counter pain medications. Acetaminophen and non-steroidal anti-inflammatory drugs (NSAIDs) such as ibuprofen and naproxen are the most common pain medication options. However, these pain medications have a variety of side effects, so it's important to discuss your personal health risks with your doctor when considering long-term use for chronic conditions such as osteoarthritis. Acetaminophen (Tylenol and other brands) is usually effective for mild pain and is easy on the stomach. However, it is toxic to the liver at high doses. The recommended maximum per day is generally set at 4 grams (4,000 milligrams), which is the equivalent of eight extra-strength Tylenol tablets. But that dosage can still cause liver problems for some people. To be safe, aim for 3,000 milligrams or less, and be cautious of mixing multiple products containing acetaminophen, such as a pain reliever and a cold medication or a prescribed narcotic. The FDA now recommends using products containing no more than 325 milligrams per pill or capsule (the equivalent of regular-strength Tylenol rather than extra-strength) in order to avoid excessive dosages. 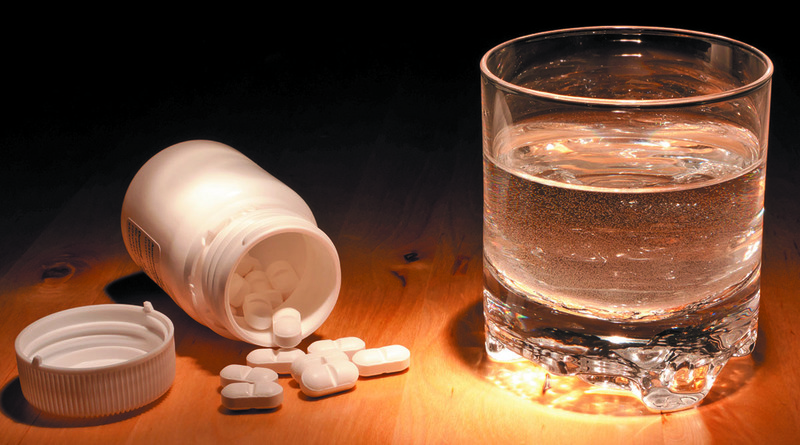 Don't take acetaminophen if you drink more than a moderate amount of alcohol on a regular basis or if you have liver disease. NSAIDs such as aspirin, ibuprofen (Advil, Motrin), and naproxen (Aleve, Anaprox) may be more effective than acetaminophen for certain conditions because they reduce inflammation as well as relieve pain. But NSAID medications have side effects, the most common is stomach irritation. It can also cause stomach and intestinal ulcers, which can lead to internal bleeding. You can ask your doctor about taking a stomach acid inhibitor to reduce these risks. NSAIDs also carry an increased risk of heart attack, stroke, and kidney failure when taken at high doses or for long periods of time. Taking acetaminophen along with an NSAID may provide equivalent pain relief with lower doses of both pain medications, thus minimizing side effects. You can also alternate between the two to reduce the risk from either type of medication. For additional advice on reducing knee pain, review Knees and Hips: A troubleshooting guide to knee and hip pain, a Special Health Report from Harvard Medical School.